Carthage’s Matt Reinsel sets a pass during Saturday’s match against Fontbonne at Tarble Arena. Carthage’s Blake Arnold makes a pass to a teammate Saturday against Fontbonne at Tarble Arena. See story on Page B1. Braeden Waumans. Carthage College men's volleyball. Evan Walsh. Carthage College men's volleyball. Matt Slivinski. Carthage College men's volleyball. Parker Connolly. Carthage College men's volleyball. This one definitely wasn’t in the plans. 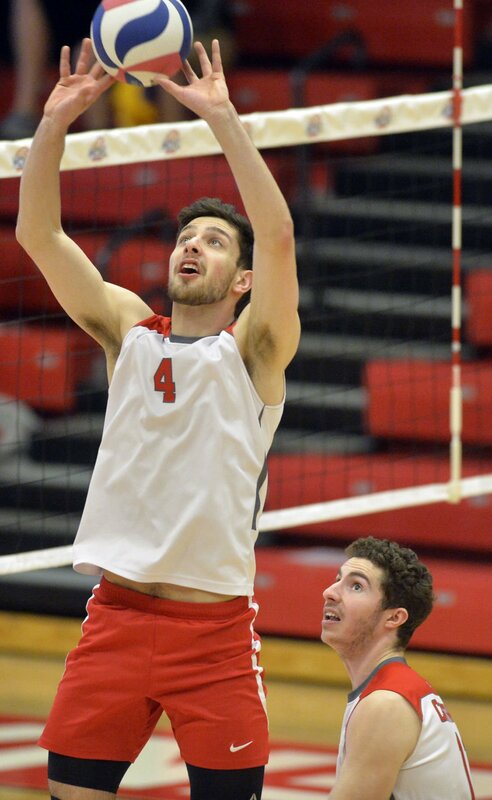 With a three-set sweep over visiting Fontbonne during the regular season to its credit, the Carthage men’s volleyball team had its sights set on another victory Saturday and the Midwest Collegiate Volleyball League Tournament title. Fontbonne clearly had other plans. The Griffins forced a fifth and decisive set that they led from start to finish to earn a 14-25, 25-23, 20-25, 25-22, 15-8 victory in front of 732 fans at Tarble Arena and the automatic NCAA Division III Tournament berth that comes with the championship. Carthage (23-2), ranked No. 1 in Division III, now has to sit and wait until Monday at 9 a.m. to learn its postseason fate. The tournament field will be announced at 9 a.m. on NCAA.com. Marx and the rest of his team will have to fill in the time gaps until Monday morning. “Sit and wait,” Marx said when asked of his plans until then. “We don’t know what’s going on. Sundays are usually our day off, so we’ll just hang out and wait and see what happens Monday morning and where our fate lies. Fontbonne used a 4-1 scoring run in the fourth set to earn the 25-22 win, and then used that momentum to build an early 8-3 lead in the final set. The Red Men never lost hope. “Being down in the fifth set is challenging as a team and as a whole to stay positive and to stay together as a team,” Carthage’s Evan Walsh said. “But I think we gave it all we (had). Carthage pulled within six points at 12-6 on an error by Fontbonne and to within 14-8 on a kill by Matt Slivinski, but the Griffins were able to close it out. Leading the way for the Red Men were Braeden Waumans (15 kills, four aces), Walsh (15 kills, two aces, 17 digs), Slivinski (14 kills, five blocks), Eric Winter (five blocks), Parker Connolly (four blocks), Reinsel (53 assists) and Blake Arnold (18 digs). While the loss was a bitter pill to swallow, Marx said, it can’t diminish what the team — and the senior class — has accomplished. “The biggest picture is nobody likes losing, and losing kind of stinks, but in the grand scheme of what these (senior) guys have accomplished on and off the court over those four years, there’s nothing to be ashamed of,” he said.